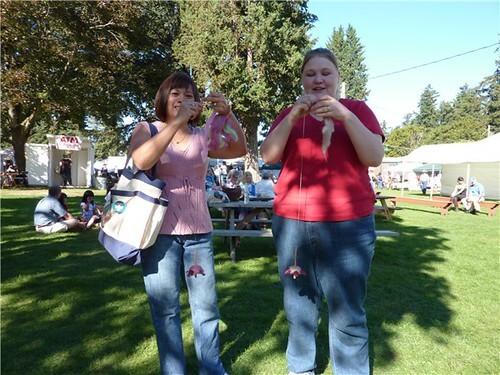 This entry was posted in events, Knit, spinning and tagged OFFF, OFFF 2013. Bookmark the permalink. 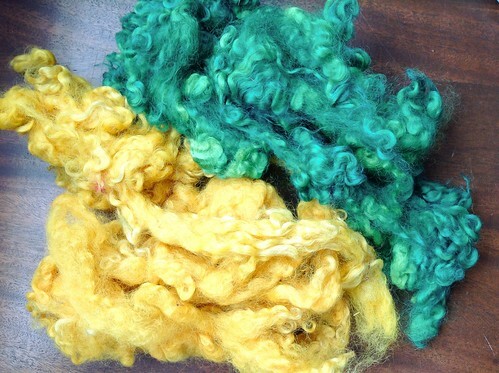 I bought two skeins of beautifully hand-painted tencel yarn from Teresa Ruch. She had a shawl/scarf up in the gallery that was simply gorgeous – and I couldn’t resist. She’s a weaver and suggested two different color ways for warp and weft. anxious to start! 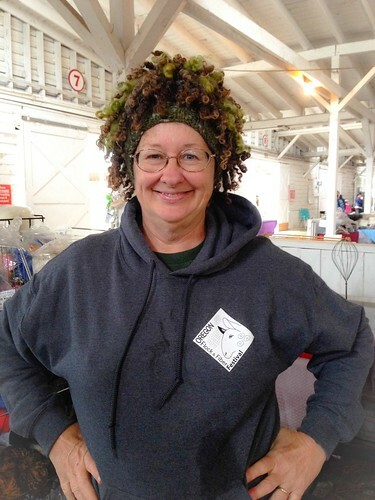 Your class was awesome Michele – I learned so much. I wouldn’t mind learning how to spin on that little thing you talk about – any chance of a class in that? You are my favorite teacher – so encouraging. Thanks for taking my class! 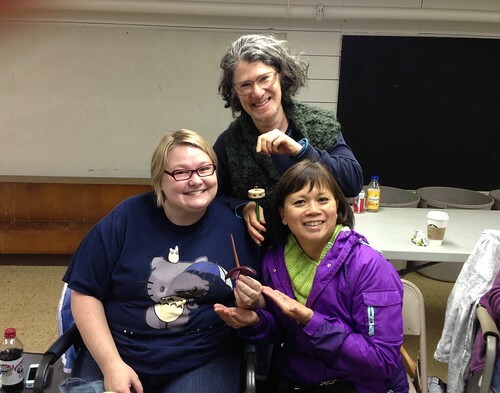 I am not experienced enough with the drop spindle to teach a class, but if you want to sit down and play with a spindle one day, that would be fun. 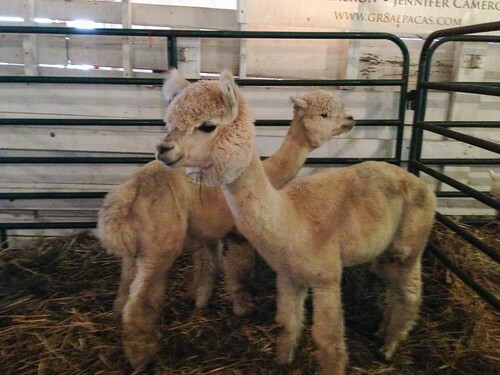 Looking forward to seeing your new yarn! After swearing I was only going to buy 2 skeins of neutral yarn I needed to make Monomania, I gave into desire and came home with a HansenCrafts minispinner…and nice timing as our power kept going out! As yucky as the weather was, OFFF was still fabulous! It takes more than a little wind and rain to stop fiber people! Congrats on the minispinner; those are very cool. Enjoy! Oh how I wanted to be there this year! I am drooling over your fiber. I have just gotten into spinning and am fortunate to have a kromski. 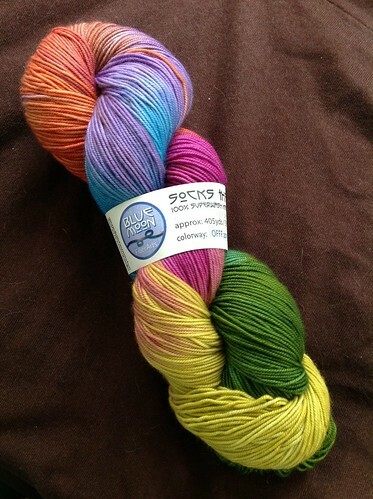 Oh, and your sock yarn from Blue Moon… Love love! You have a wheel? Lucky you! You should have come; there was more fiber there than I remember from past years. Still lots of yarn, though! 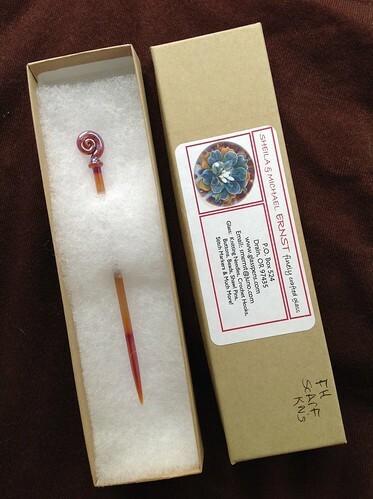 The shawl pin is gorgeous! White and fuzzy! I don’t think of sheep when I think of Florida. And you’re not exactly out in the country. Cool! I really wanted to be there, but my whole family was sick as dogs… appropriate I guess, since it was also raining cats and dogs! 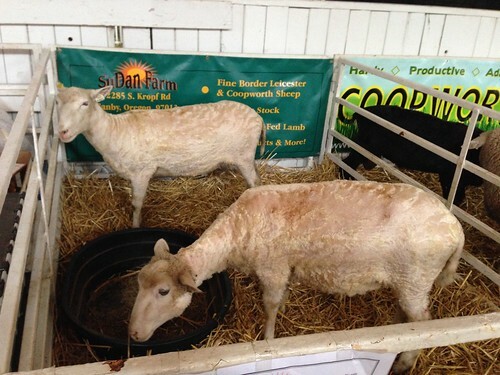 But I’m sure I would have spent way too much money and I would have been tempted to bring home a cashmere goat. To console myself, I just ordered my first spindle…I’ve had a craving to learn to spin ever since OFFF last year and I’m finally going to give it a go! I need one of those awesome t-shirts! It was very fun, even if it was very soggy. What kind of spindle did you get? Have you tried it yet? 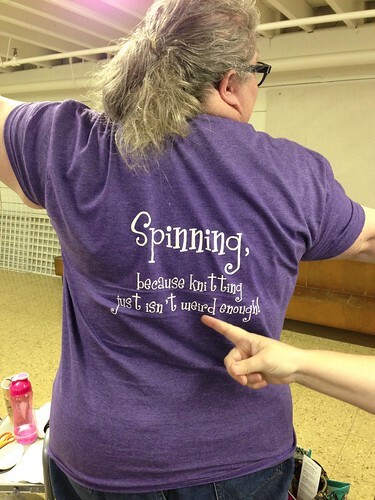 I’m going to order a t-shirt, even though I’m not spinning much. It’s just too cute! I got a Schacht Hi-Lo spindle. I’m trying it out this week, and I just started last night. So far it seems pretty fun, and not too difficult, but I’m a little confused about how much twist to add. I’m going to do some more research about it, but in the meantime… any quick tips? Brinyon Conboy of Flair Designs designed the Portland Spinnerati t-shirt. She did an awesome job! Love that BMFA colorway. They always have the best colors! Looks like a great time.